It’s still occasionally hard to believe that the once all-powerful Big 3 North American automakers have been reduced to all but rubble. 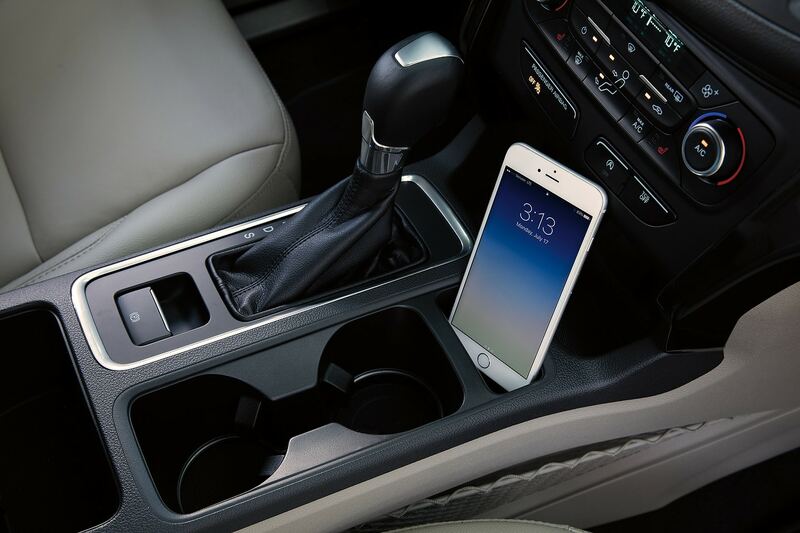 With the sole exception of full-size pickups, they no longer own any other segment. With their truck experience and expertise, one would think that the best SUVs are American. Well, truth is that some are good, but they’re not always the best. 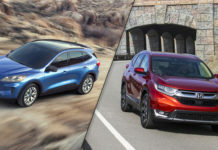 In the extra-hotly contested compact CUV segment, the Jeep Cherokee and Ford Escape are quite popular. 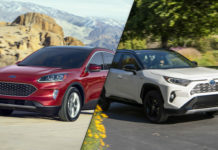 GM has the Chevy Equinox and GMC Terrain but no matter what, the Americans trail the Japanese Honda CR-V, Toyota RAV4 and Nissan Rogue by a considerable margin in North America. Which is more enjoyable to drive? Ford and Jeep marketing departments have very different twists on their products. Fact is that no matter how rugged or off-capable the Cherokee might be, both it and the Escape will just about never leave the paved road. 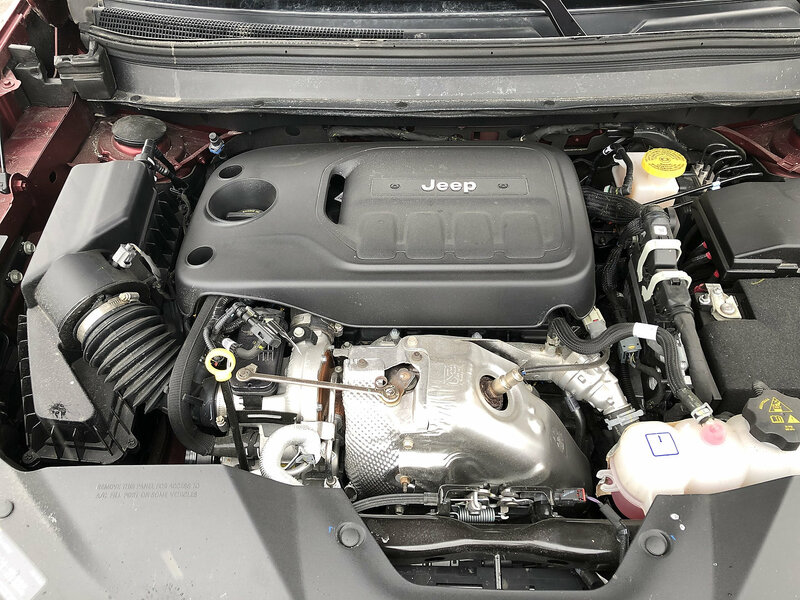 The big news with the 2019 Cherokee is the addition of the new turbocharged 2.0-litre 4-cylinder engine. 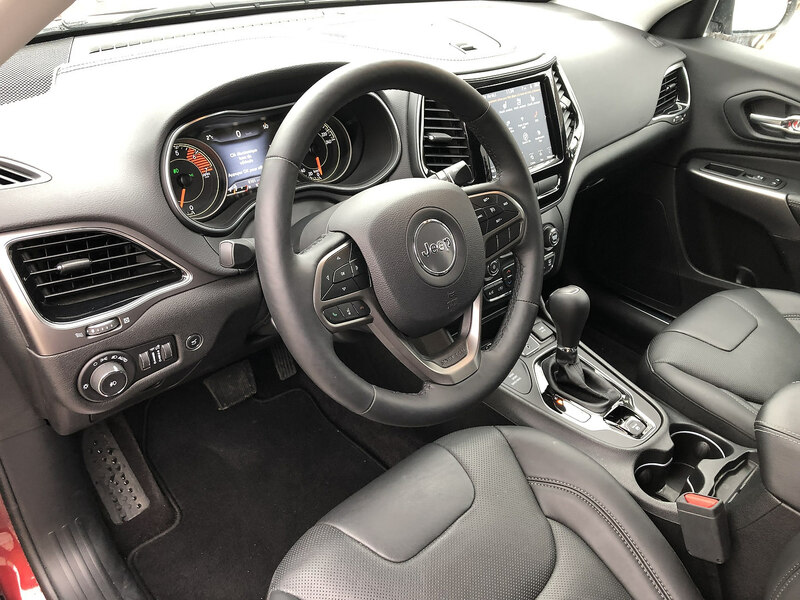 Its power and response are nothing short of impressive and until I drive the new 2019 Mazda CX-5 with the 2.5T, I believe it’s the liveliest and quickest of the segment. The Escape’s turbo-boosted 2.0-litre is nearly as potent however must run on the premium stuff in order to deliver. Even so, this too is one quick SUV. 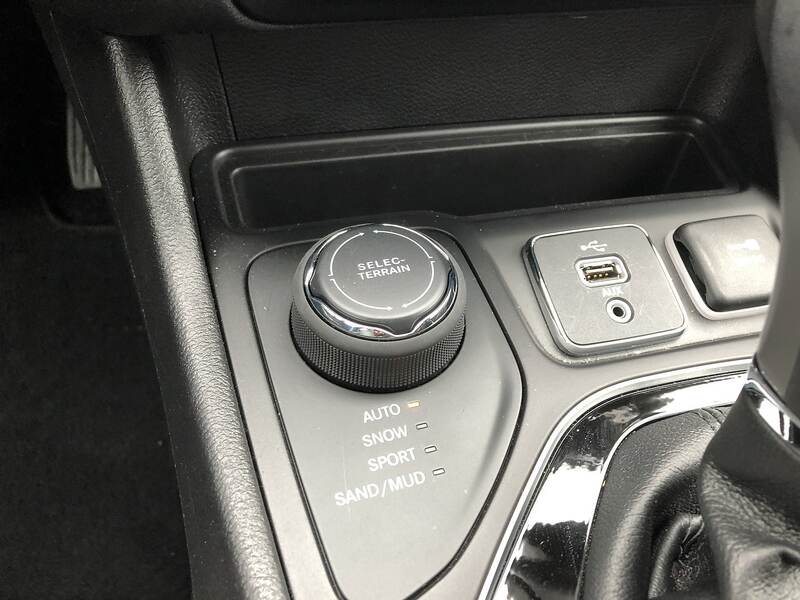 The 6-speed automatic transmission is not as gifted at the Jeep’s 9A but it also does not suffer from temperamental behavior. The proof that these small ‘utes are mainly tuned for the urban jungle is that they excel at cruising narrow streets, soaking up ugly paved roads and keeping on the straight and narrow on the highway. Chassis dynamics for both lean more towards sportiness than all-out comfort. When road conditions do deteriorate, Jeep’s Active Drive AWD system runs absolute laps around Ford’s less-than Intelligent 4WD system. So, on the one hand, we’ve got a recalcitrant transmission and on the other, an inferior AWD setup. 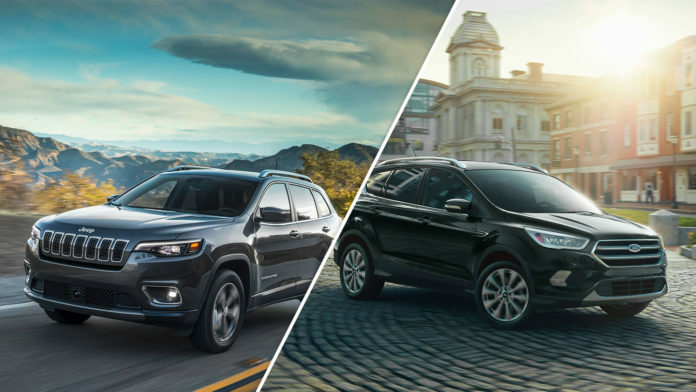 On paper, the 2019 Jeep Cherokee is more fuel efficient. 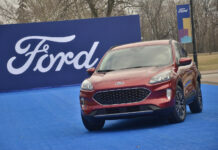 In fact, not only is the Jeep’s 2.0T stingier than the Ford’s 2.0T but it officially matches the Escape’s 1.5T EcoBoost engine. The numbers are as follows: According to Ford, the Escape 2.0T AWD consumes 11.5/8.7 L/100 km highway/city. Jeep specifies that the AWD 2.0T Cherokee gulps 11.2/8.1 L/100 km highway/city. Here too, both compact SUVs meet somewhere in the middle with one exception. While Jeep boasts that the Cherokee’s boot can handle a maximum of 781 litres of gear, the Ford Escape is rated at 964 litres. The Jeep’s trunk is a little wider at first but with little depth. The Escape’s cargo space is far more user-friendly. Aboard, the Escape and Cherokee provide similar high rear seating positions. Three abreast is possible for a short while. 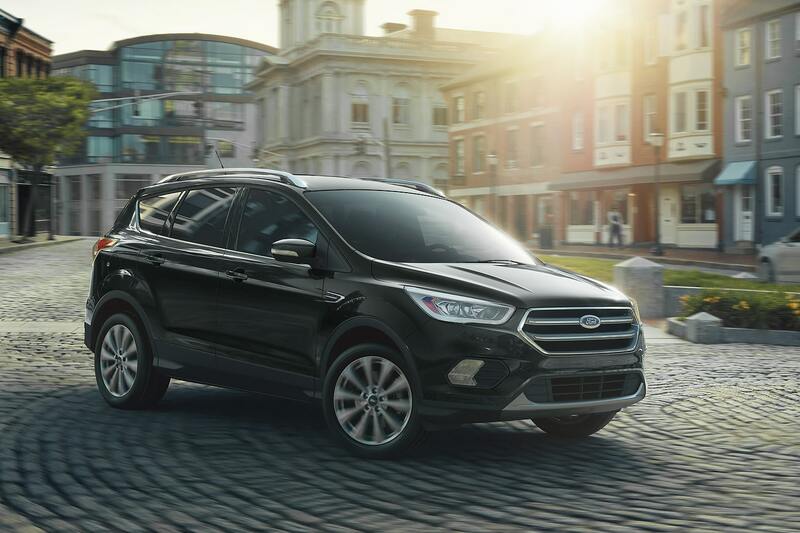 Up front, the Escape suffers from Ford’s now older dash design that pushed the top part of the center console into the passenger’s bubble. The Cherokee’s IP is further away providing an airier feeling. 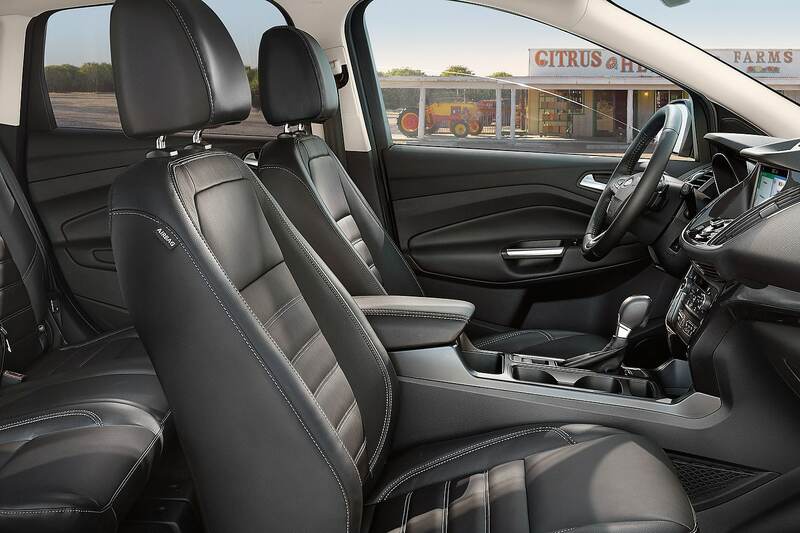 Front seats are comfortable in both vehicles and while the Ford’s trunk offers more capability, we do sit in the vehicle so human comfort wins out over boot space. Which has the better value? 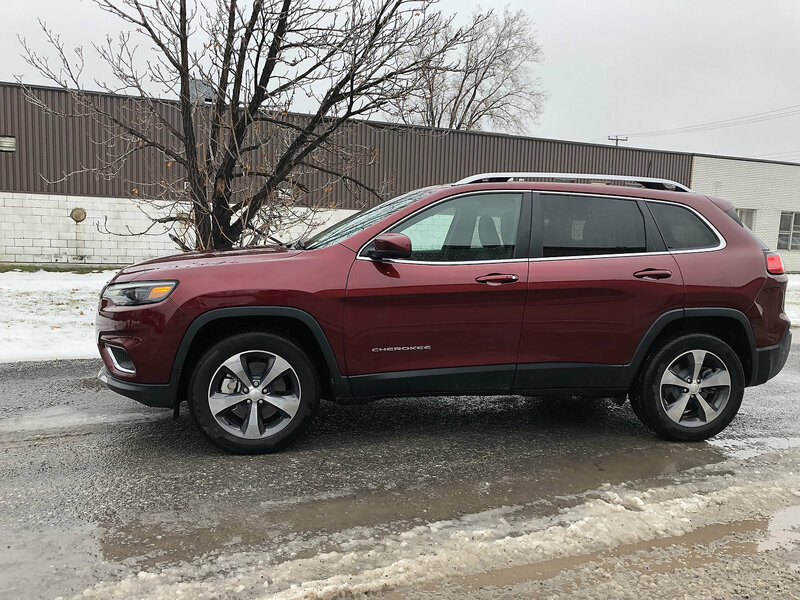 A base FWD 2.4L Cherokee Sport retails for $31,990! 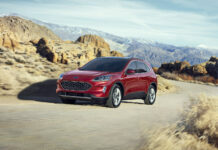 A base 2019 FWD 2.5L Escape S is $26,299. Compared to all of its principal competitors, it is at least $2,500 more. Sure, Jeep throws in massive rebates just for being curious about the product. It gets progressively worse the higher the trim and options. A top-line Escape Titanium with a few choice options not only looks special but will cost between $41,000 and $42,000. My recently tested handsome yet mundane Limited with options retailed for over $47,000! Here, Jeep drops a $6,000 rebate and with good reason. The only real value to be found with the Jeep Cherokee comes from the specialized versions, in other words, the Trailhawk. This Cherokee has no direct competition so Jeep can charge whatever they please. 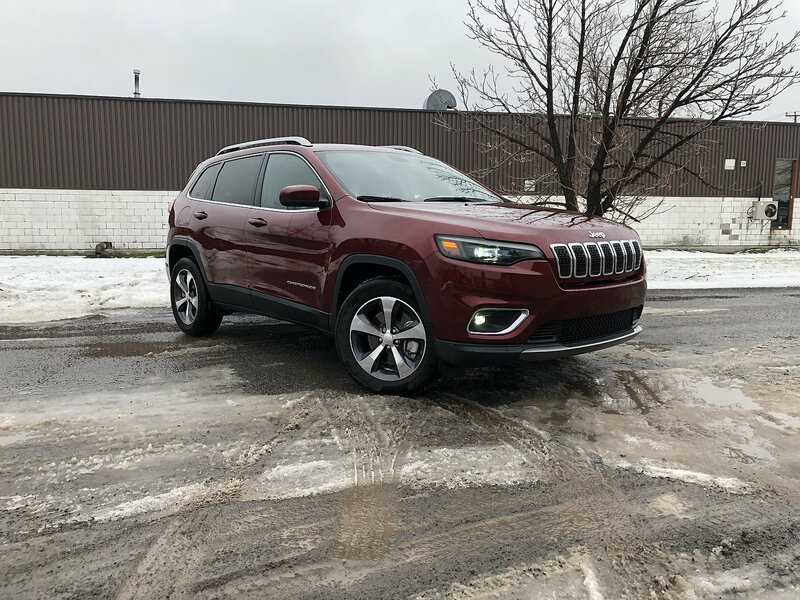 And here’s what’s interesting: By my non-scientific calculations and observations, it’s the most interesting and value-packed iteration of the Cherokee. The answer here is, um, neither. With the sole exception of the Trailhawk. If your cabin is in the middle of the Chugach National Forest, in Alaska, there are no alternatives. If you live in Toronto or Chicago, a Toyota RAV4 or Mazda CX-5 will do the job. 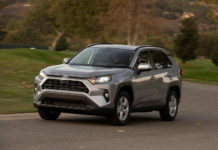 The main issue with the Ford Escape and Jeep Cherokee is reliability, specifically in the mechanical component department. 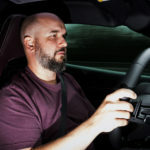 Both have experienced engine or transmission problems in the past and although they’ve likely been addressed, we’d stick with the aforementioned options. Having said all that, if we had to select from the Escape and the Cherokee, the result of this comparo test leans ever so slightly towards the Ford. 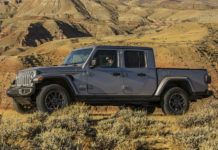 However, we’d probably head on over to a Jeep dealer, ask them why the hell the Cherokee is priced so high, haggle, yell some more, and leave with an Olive Green 2.0T Trailhawk with a few options. Next articleCould Tesla Be Moving Into Oshawa In The Future?